Ozone test chamber is a major factor in rubber cracking although it is rare in the atmosphere, ozone aging tank simulates and enhance the condition of ozone in the atmosphere to study the effects of ozone on rubber, and then identify and evaluate the method to resist ozone and aging for rubber, adopt effective anti-aging measures to enhance the life of rubber products. Ozone test chamber can be used to test rubber products with static tensile deformation, such as vulcanized rubber, thermoplastic rubber, cable insulating bush; Expose the test specimens to the sealed air in the ozone chamber without light and with constant ozone concentration and constant temperature according to predetermined time, and then observe the cracks on test specimens’ surface and the degree of change of other properties to evaluate the rubber’s ozone aging resistance properties. 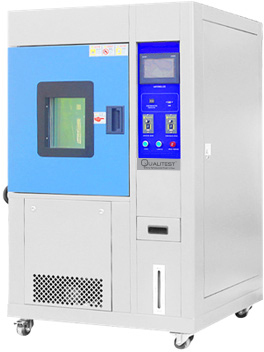 The ozone test chambers are widely used to control products quality in measuring quality control; Rubber & Plastics; Automobile production; Wire and cable; Packing materials; Instruments and meters; Medical equipment; Civilian nuclear energy; Civil aviation; Colleges and universities; Research laboratories; Inspection arbitration, and technical supervision departments and other rubber products. Ozone test chamber simulates and strengthens the conditions of atmosphere ozone, study the role of the law of ozone on rubber, rapidly identification and evaluation of rubber resistance to ozone aging properties and protective efficacy of anti-ozone agents, and then take effective anti-aging measures to improve the life of the rubbers.